PURCHASE WOOD BLINDS AT SHEILA’S WINDOW TOPPERS. Graber Wood Blinds are made with high quality wood as well as high qaulity working mechanisms and are a great price in the world of Window Coverings! Create breathtaking views with Graber Traditions Elite Wood blinds. There rich collection includes Authentic Hardwoods in Cherry, Walnut and Maple, as well as many other paint and stain colors to coordinate with today’s popular cabinet, flooring and furniture finishes. Custom Color is another option for limitless color choices. Traditions Shutter Style Wood blinds are crafted from North American hardwoods that have been harvested through sustainable means. Beveled slats resemble shutters and provide a superior view to the outside. These horizontal blinds have a rich character with their hand-selected North American hardwood, which are enhanced by their rich palette of stains, paints and exclusive finishing process. 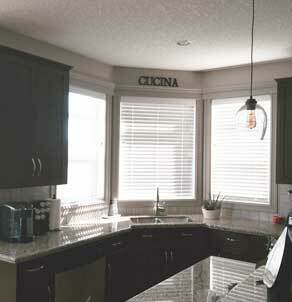 Graber horizontal blinds use premium North American hardwood, which give a luxurious finish. Choose from their distressed, barnwood, ashwood and bamboo, which can coordinate with today’s popular home furnishings. Learn more about Wood Blinds.